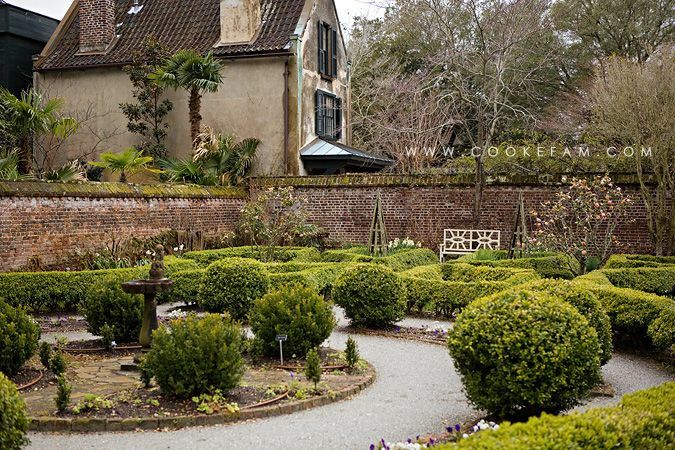 My mom and I decided some time last year that we should take a trip to Charleston, SC this spring. 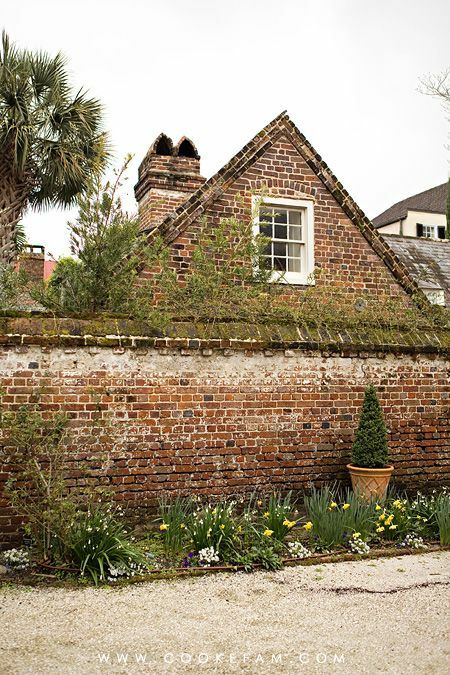 Both subscribers to Southern Living magazine, we'd seen the charms of Charleston on the pages of the magazine and thought we should see it for ourselves. Spoiler alert: that was a good idea. We worked our trip out for the first few days of the boys' spring break so that my mother in law could keep the boys in her town and they would not have to be at school. So, we took off on a Friday morning for South Carolina. Here we are at the airport bright and early. Even though this was supposed to be "spring," Dallas and Charleston did not get the memo. It was about 45 degrees (that's cold for me) that day. That plane is about the same size as the one we took to Charleston. There's a row of single seats on the right side of the plane and rows of two on the left side. And only one flight attendant and bathroom. 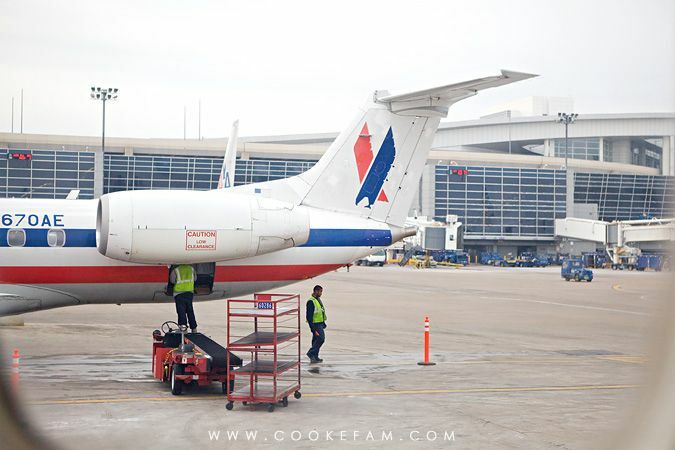 Actually, it was the same aircraft we flew in for our Asheville, NC trip in 2012. A few hours later we landed in Charleston, where it was not only in the 40's but also raining. We made our first stop at the Hominy Grill for lunch. 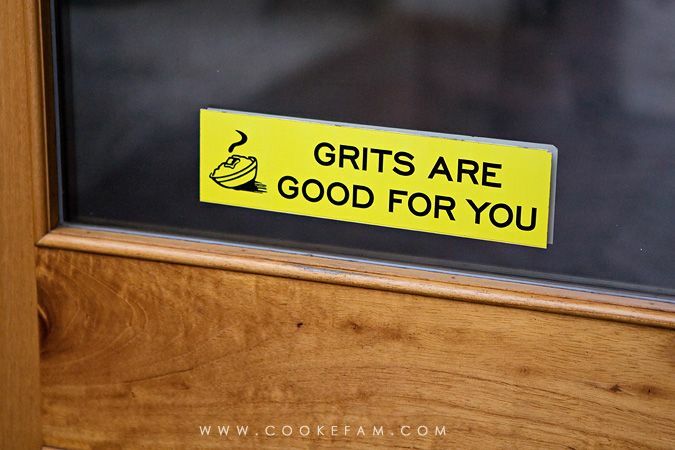 We figured some hot grits would go a long way in warming us up. And we were really hungry. 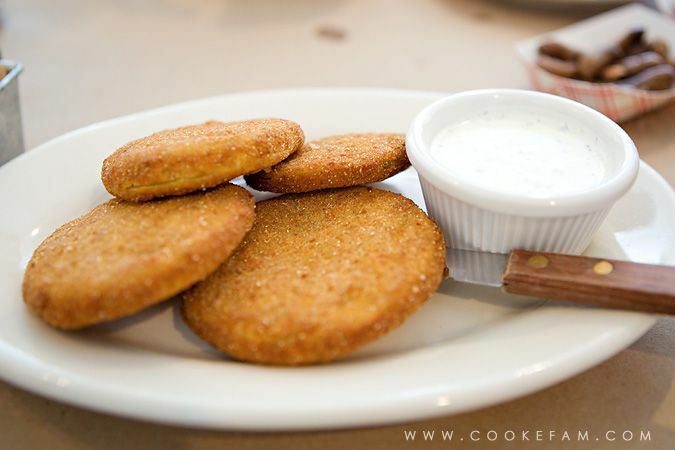 First, I ordered sweet tea, of course, and we shared an appetizer of fried green tomatoes with house-made ranch. 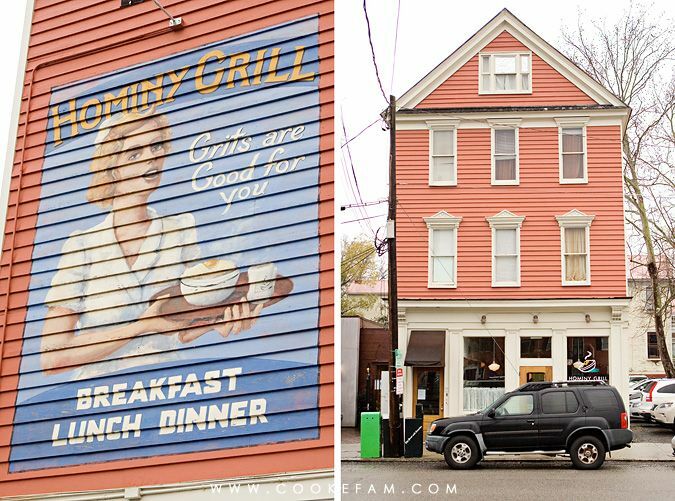 This kind of set the bar high for all of the food we would have in Charleston. It was delicious. Actually, the very first thing we had were the boiled peanuts they brought to our table in a paper bowl. Even though we live in the south, boiled peanuts are not really a "thing" in Texas, so this was my first time to have them, believe it or not. I'm sold. I loved them. 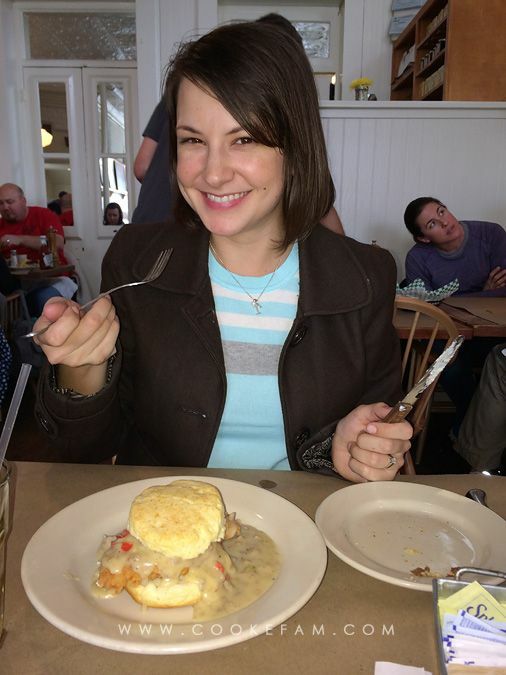 I ordered one of the Hominy Grill's signature dishes called the Charleston Nasty Biscuit. Strange name, amazing comfort food. 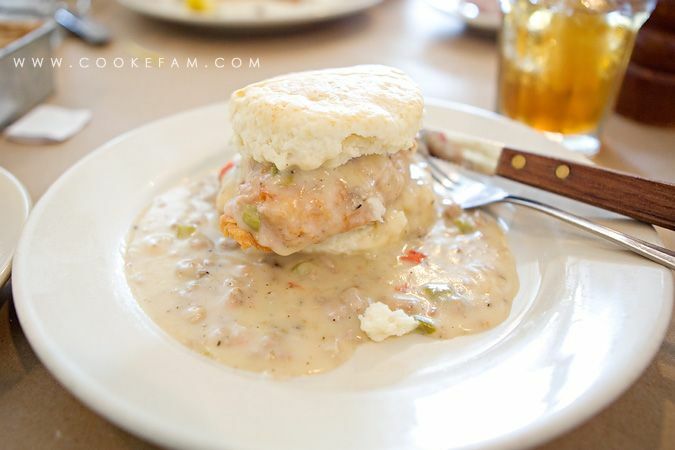 It's fried chicken on a buttery, flaky biscuit with cheddar cheese and sausage gravy. 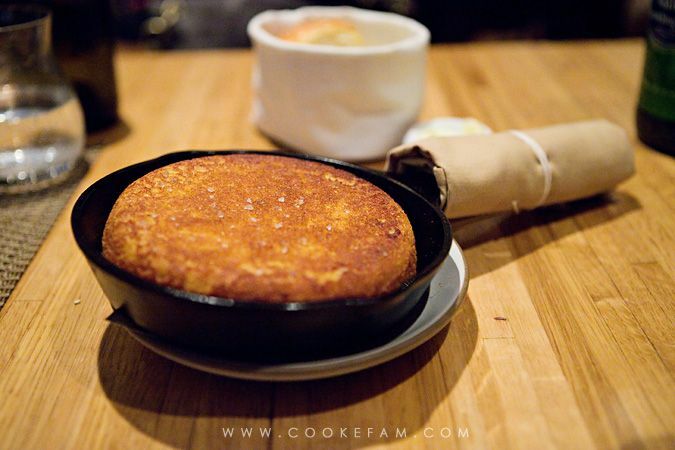 If that's not southern comfort food, then I don't know what is. I would order this dish every day of the week and twice on Sundays. Mom went classic and ordered another house special...the shrimp and grits, which was also delicious. 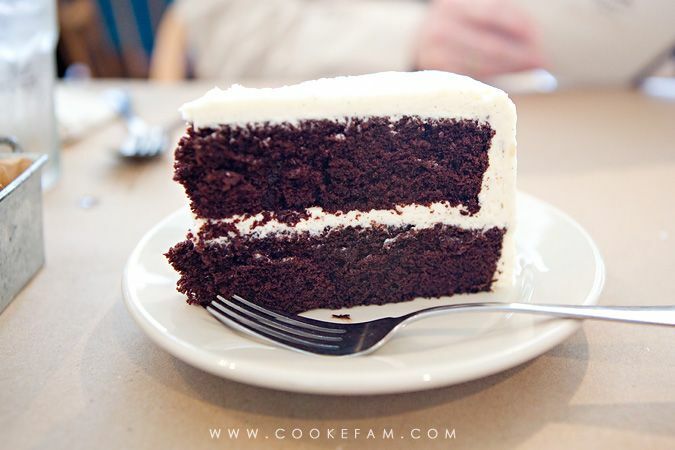 Then we ordered the waiter-recommended devil's food cake with vanilla buttercream frosting for dessert. I was underwhelmed. Don't get me wrong, it was good. Just not great. I think it needed to be sweeter...I know that sounds crazy. We were so taken with our food that we asked to look at the recipe book that they sell. After perusing the recipes, mom decided to buy one. I can't wait to cook up some of the stuff in there! 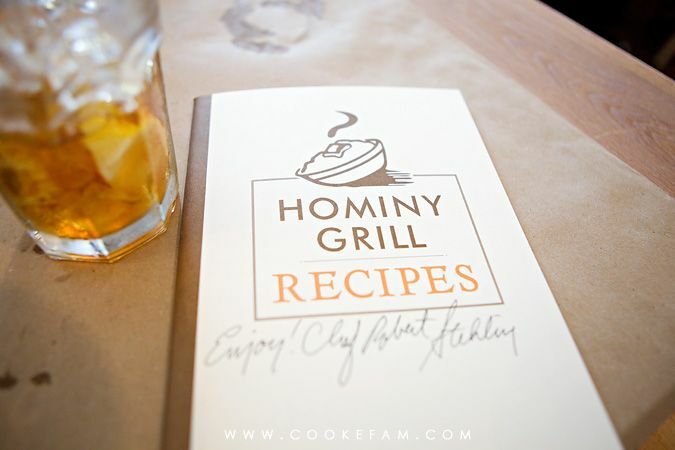 All over the Hominy Grill you will find this logo, including on the door, walls, and the wait-staff shirts. 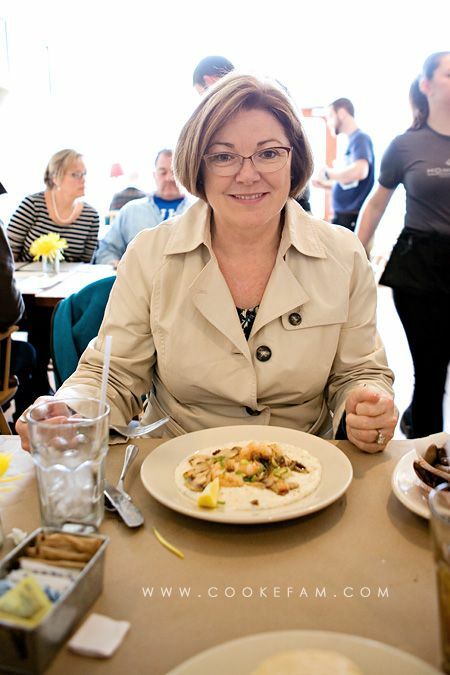 The Hominy Grill popped up again and again when I was researching restaurants. And for good reason. 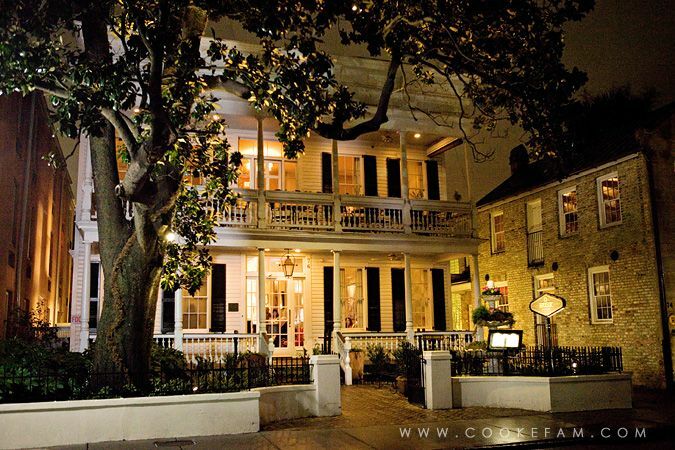 Don't skip this place if you're ever in Charleston. After lunch, we made our way further downtown and parked our car. The first of many downtown Charleston parking experiences. Then we walked a few blocks to a historic house we wanted to tour. 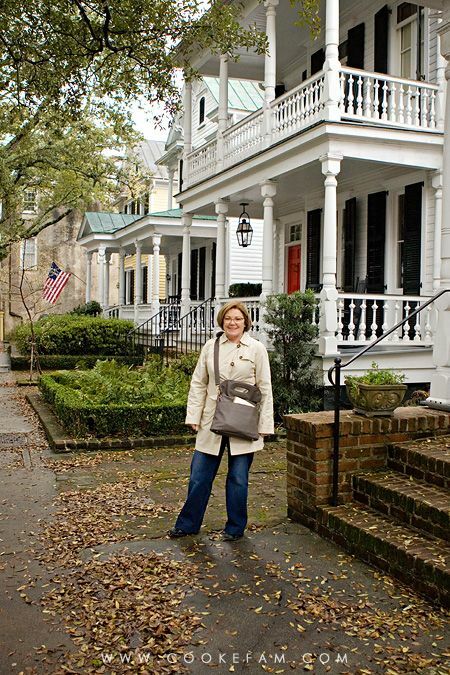 On the way, I took this photo of mom on one of the picturesque streets. They all look like that. It's nuts. 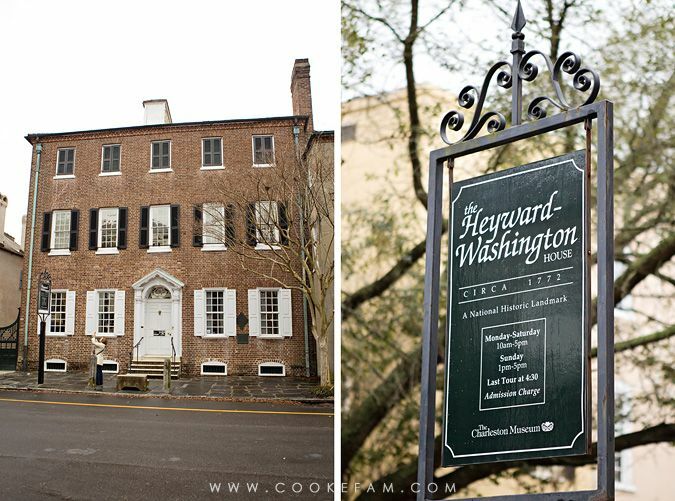 We found the Heyward-Washington house, a historic home (one of many in Charleston), which is open to the public for tours. 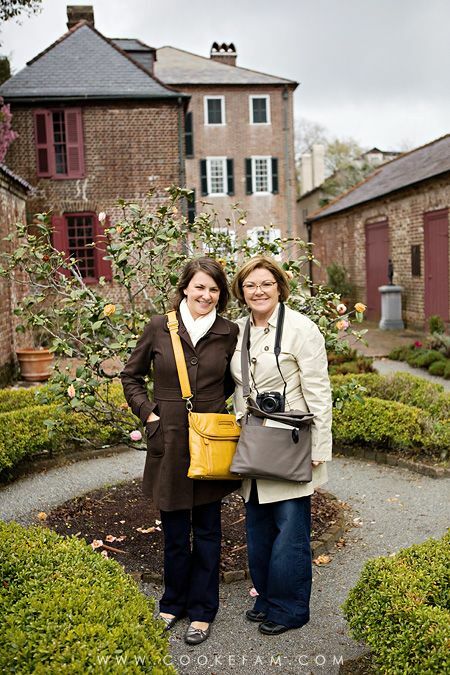 While we were waiting for our tour to start, we were ushered out into the garden and out buildings to look around on our own. 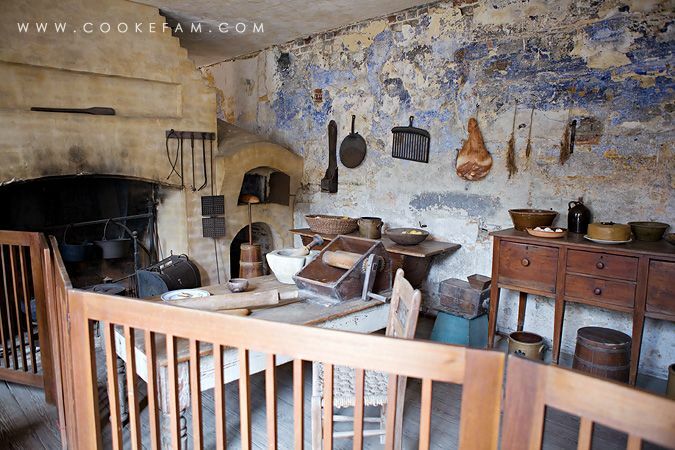 The kitchen house was out there because during the 1700 and 1800's, kitchens were built and located separately from the main house due to fire hazards. 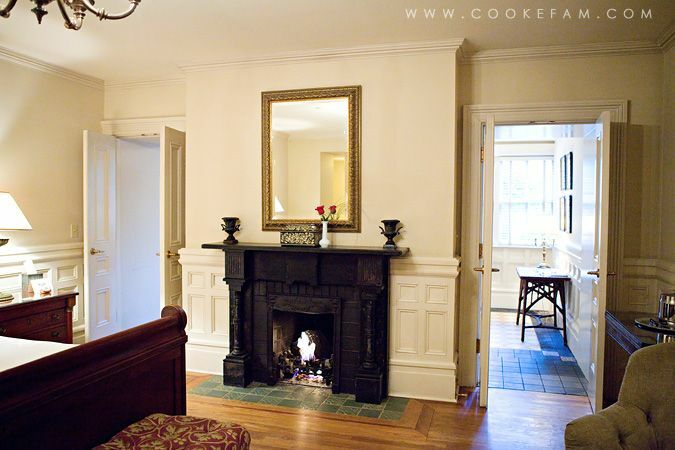 And rightly so...just look at that giant fire place. 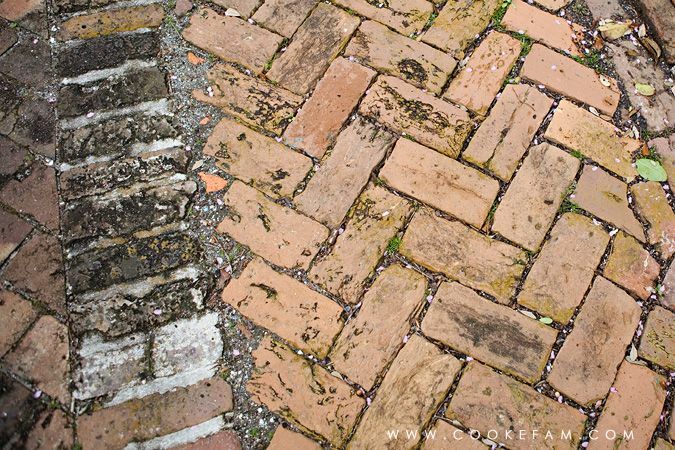 The streets and paths of Charleston are filled with old, mossy bricks. I found even the streets charming. 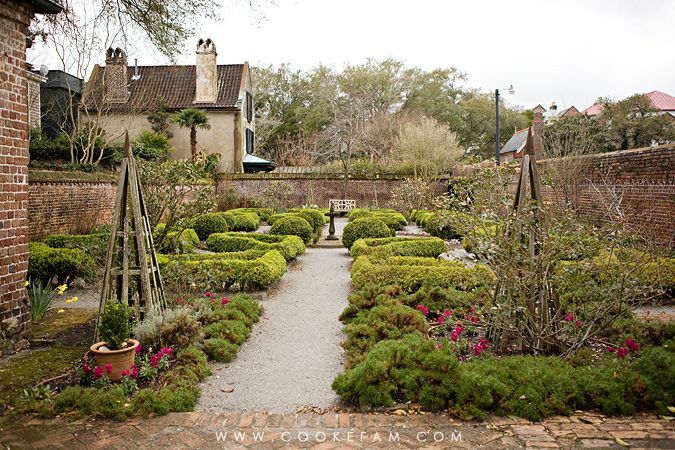 And even on this cold, blustery day, the gardens still look wonderful. And this is right smack in the middle of downtown. 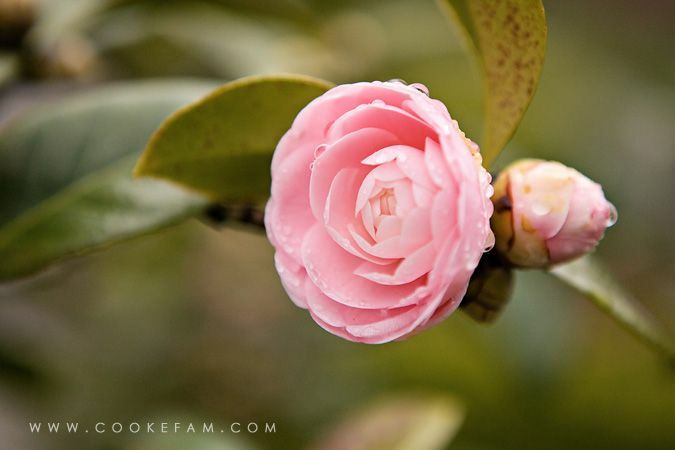 It may have been just the beginning of March, but there were plenty of flowers to greet us. I sort of became obsessed with taking photos of flowers. Just wait until day 2. Another one of the people waiting for the tour offered to take a photo of both of us. The kitchen house and main house are in the background. 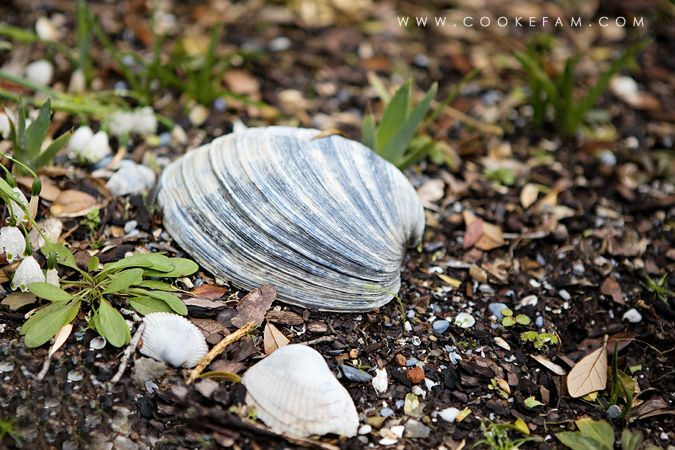 I also loved how all the shells on the ground in the garden reminded us how close we were to the sea...although we hadn't seen it just yet. Inside the house, we were allowed to take photos, which is actually unusual. In fact, this was the only house we were allowed to photograph on the whole trip. 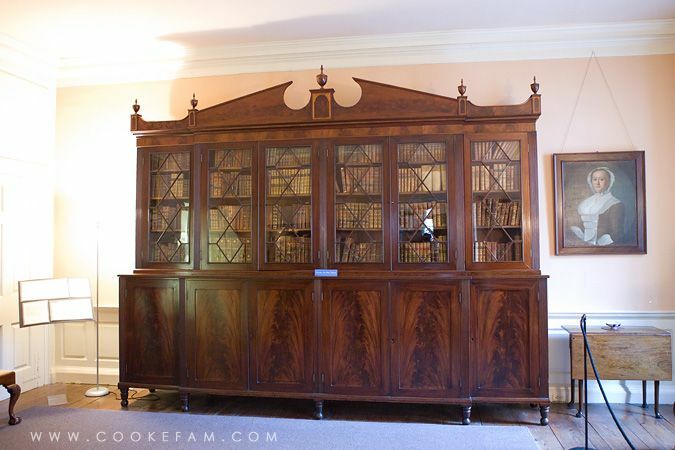 And this first photo is of a gigantic Charleston-made cabinet with all antique books inside. Dreamy. 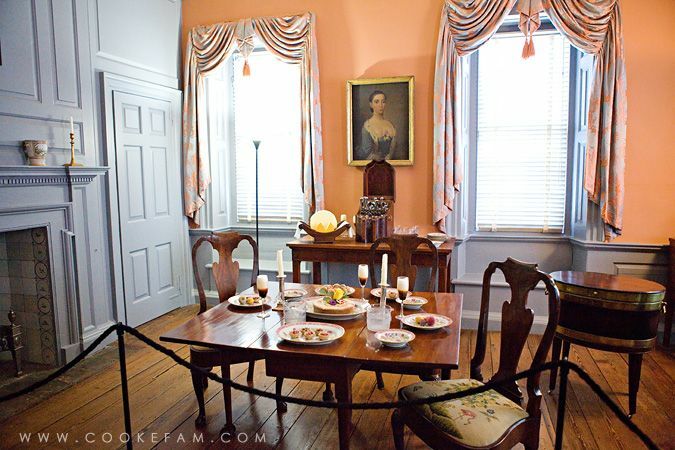 The breakfast room was painted in peach and blue/grey colors. 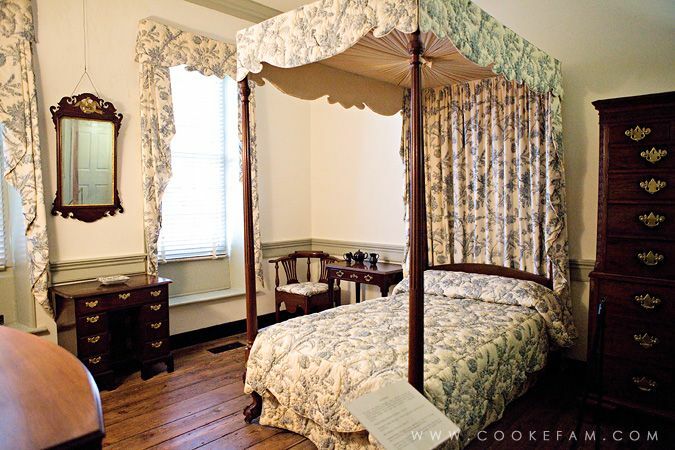 We were told that the historians put in many hours researching period colors if they were unable to find the original paint colors on the plaster walls. 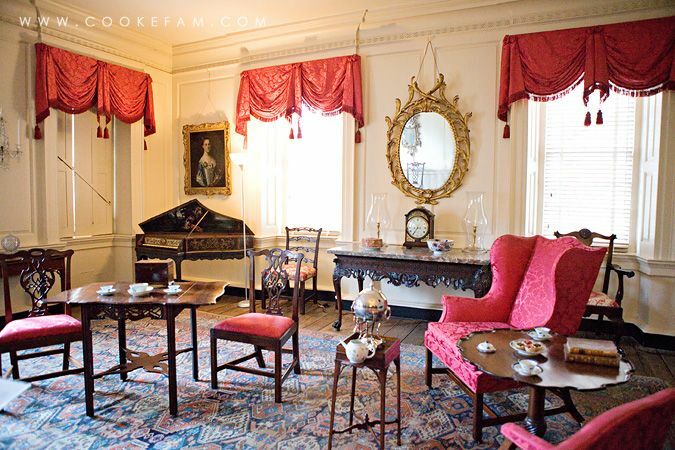 Upstairs, the salon was the largest room in the house and the one used for all entertaining. They entertained on their second floors party because the mosquitoes didn't fly up that high. Here's a bedroom with winter drapes and bed coverings. These would have been changed out in the summer for ligher fare. And the bed may have even been moved closer to the window to catch the breeze. 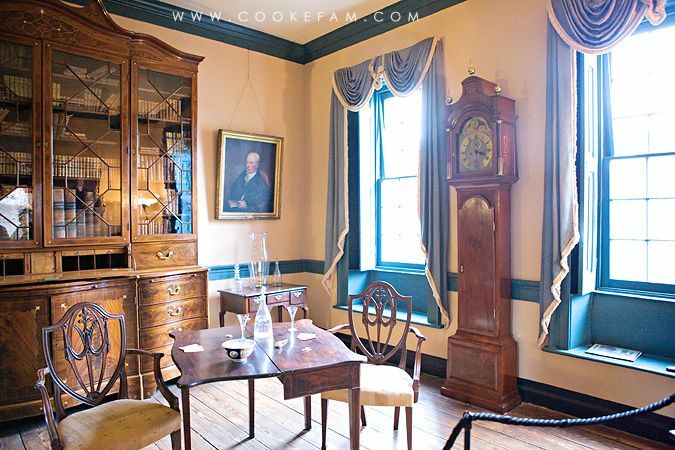 In the library/office, more period pieces made in Charleston were on display. They are in pristine condition and really exquisite if you stop to look at the detail. Or if you just like looking at antiques like I do. When we finished our tour, we made our way back to the car. 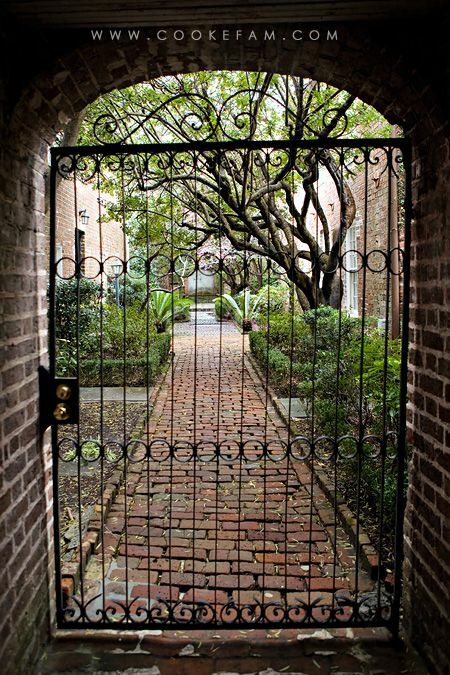 The gates, gardens and pathways in Charleston are really enchanting. It is such a beautiful city. 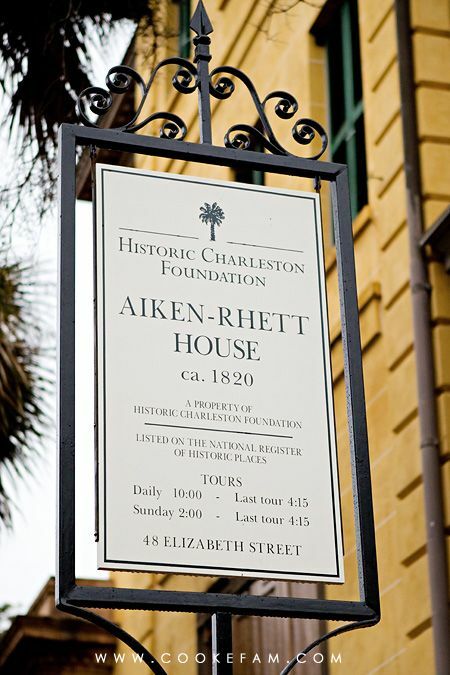 We drove to our next stop, the Aiken-Rhett house. This one was unique because it is not restored. They have left it pretty much as-is, which means we got to see original peeling wallpaper, fading, threadbare furniture, and some of the most amazing architectural elements and woodwork we would see on the trip. As much as I loved the polished, restored homes, I am so glad we visited this house to see some of the raw history. 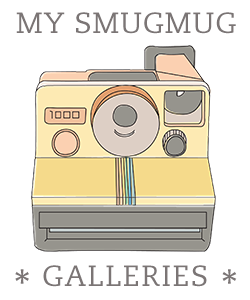 But, per house rules, no photography from the inside. After learning a little bit about Charleston history with two house tours, we finally went to check in at our hotel. 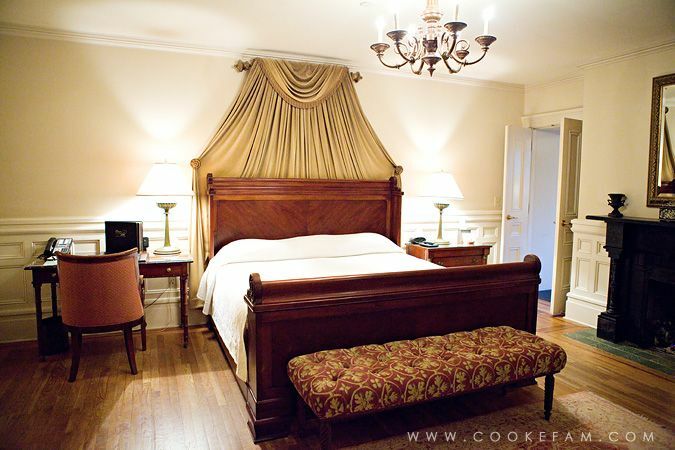 We stayed at the Wentworth Mansion, a historic site also. Because it was still so miserable outside, I didn't take outdoor photos of the Wentworth until the next morning. 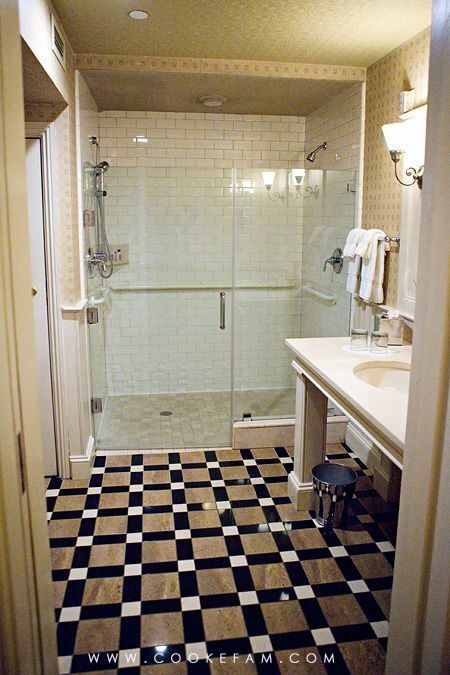 But, I did take photos of our room...here's the bathroom and the double shower head shower that I loved. 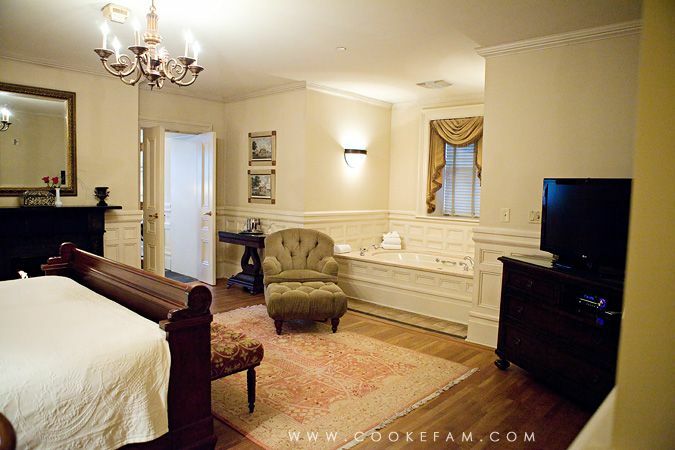 Our spacious and elegant room was one of their garden rooms on the ground floor. 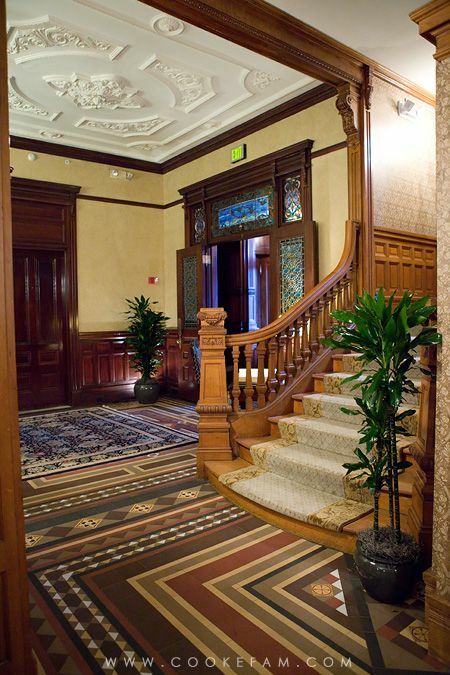 I loved the decor, and it really seemed to go with the grandeur of the mansion. But we were absolutely floored by the coziest element of the room...the fireplace. After a chilly day of traveling and touring, this was a warm, welcome sight. And the best part was that we could turn the fire on with a switch on the wall. 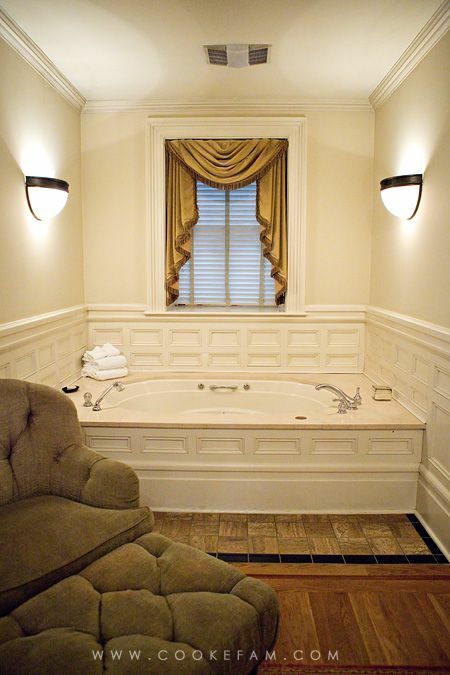 The huge garden tub in the alcove was a little bit of luxury too. I took a soak in there one night and it was so relaxing. Another fun element that I could not photograph was the classical music they had playing when we walked into the room. It was such a nice touch, although admittedly, I am a fan of classical music. 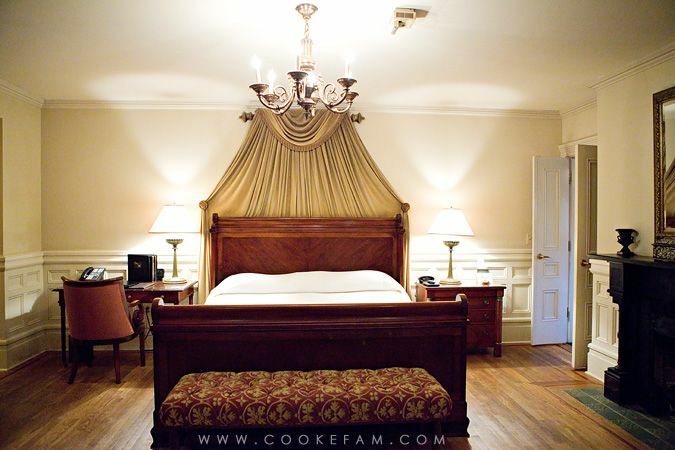 They turned it on every night as part of the turn-down service too (along with house-made chocolate truffles!). 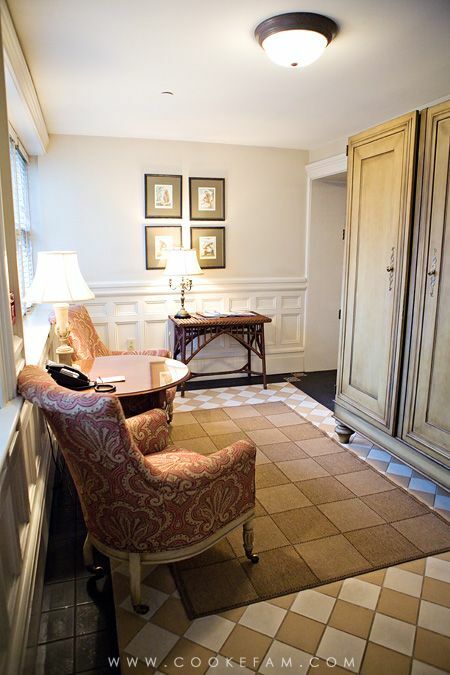 Those two sets of double doors on either side of the fire place lead out to a sun-filled seating area with an armoire packed with amenities...TV, fridge, iron, two robes (used every evening), and complementary beverages. The door on the other side of this room was also our private entry from the garden and parking lot. Quite convenient. 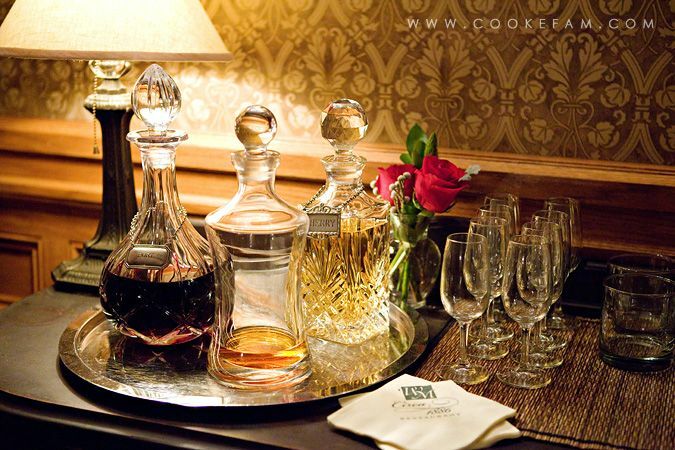 After throroughly exploring (and photographing) our room, we decided to go down to the parlor to check out the afternoon hors d'oeuvres and wine. 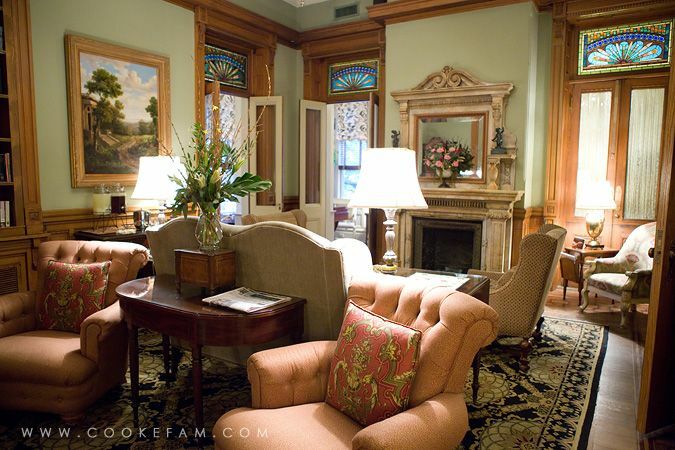 The parlor was such a lovely room with all the seating placed by the windows. Wicker and sunlight just go together. 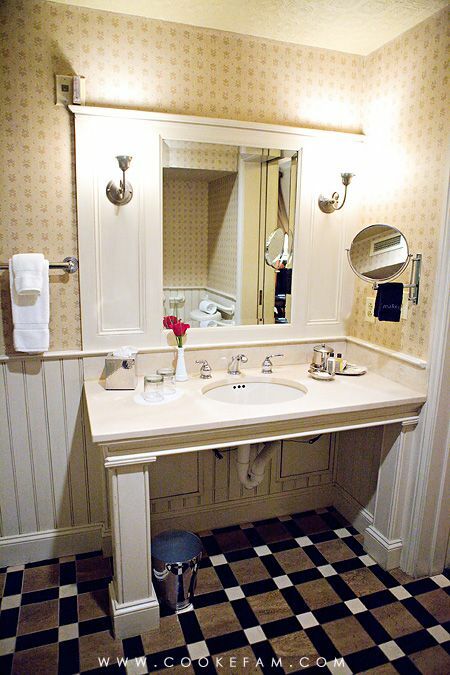 And just look at those light fixtures. I loved all the details. 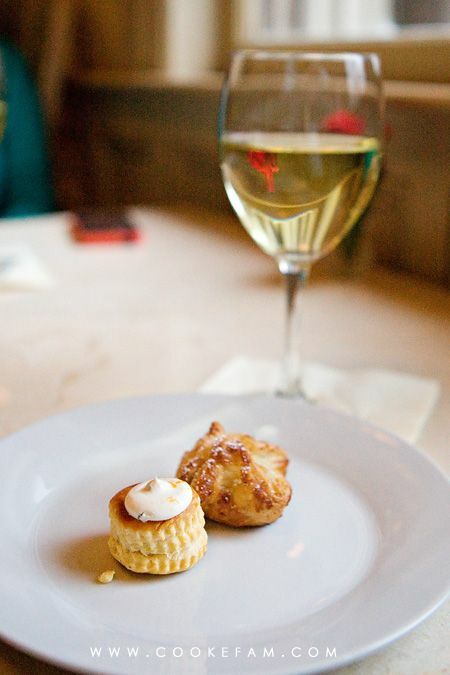 I limited myself to two hors d'oeuvres because I was eagerly anticipating our dinner later that evening. But the two bites I did have were fantastic. The one on the left was smoked salmon bouche and the one on the right was a sweet potato puff. 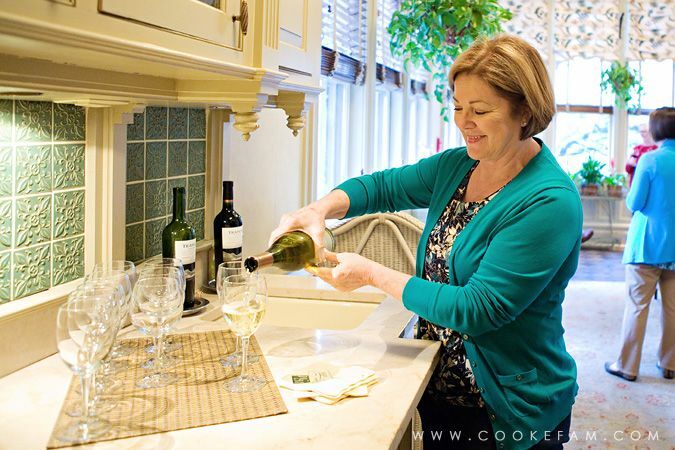 It's delightful to have wine and hors d'oeuvres in the afternoon...and never more apparent to me that I was on vacation (without kids) than during this time. 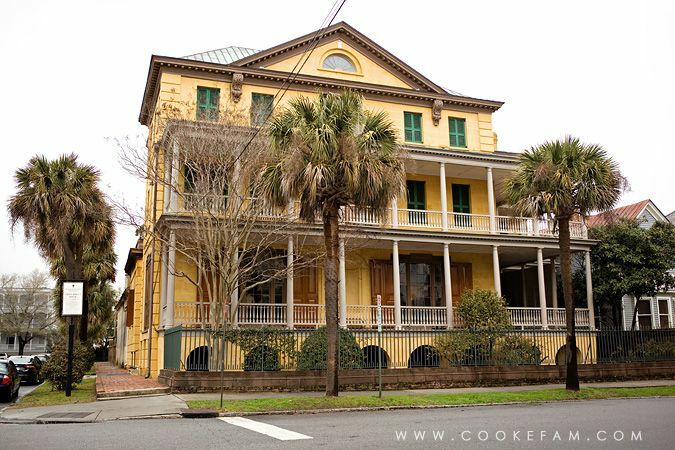 This mansion was built kind of late for Charleston historic homes...in the mid to late 1800s. Again, I loved taking in all the original details. 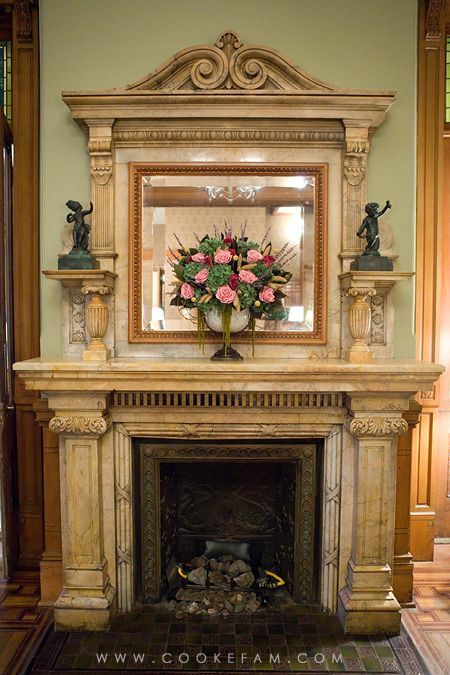 And I was dying over that (real) flower arrangement on the mantel. There's just something about fresh flowers. 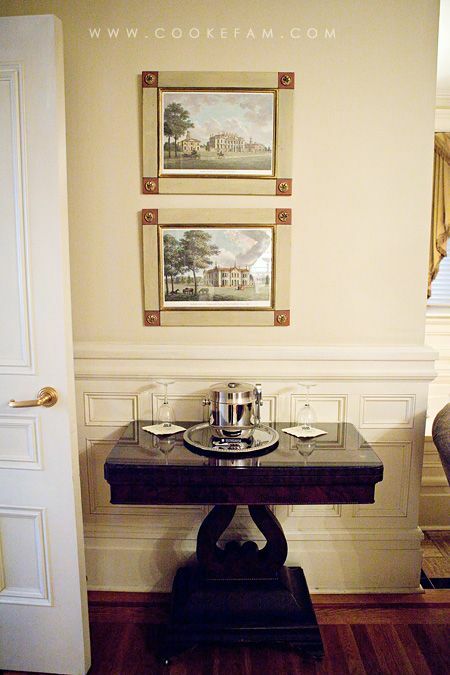 The "living room" of the hotel...besides having plenty of seating...was always stocked with some kind of refreshment. Coffee and tea in the mornings, and sweet tea and lemonade in the afternoons. 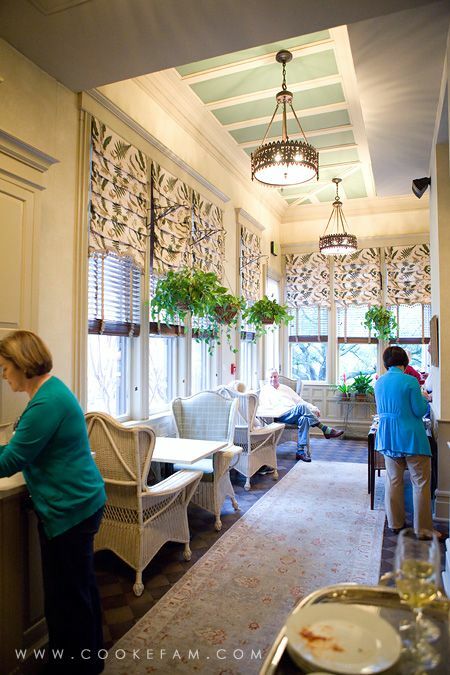 It's also hard to ignore the stained glass transom windows above the doors to the parlor. Just fantastic. Here's the entry and main staircase. 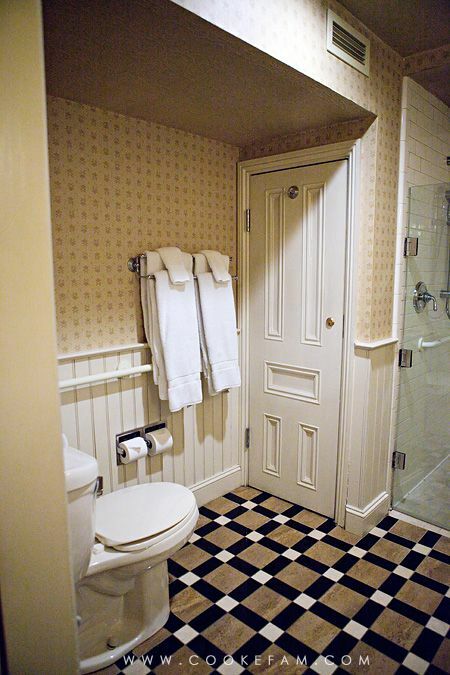 The millwork, ceilings and tile were all so beautiful and really gave the mansion a comfortable and elegant ambiance, which I really love in a hotel. If you fancy a night cap, there's always the port, sherry, and brandy they set out in the evenings. Little did we know that the hotel had even more to offer, but we'll get to that on another day of our trip. 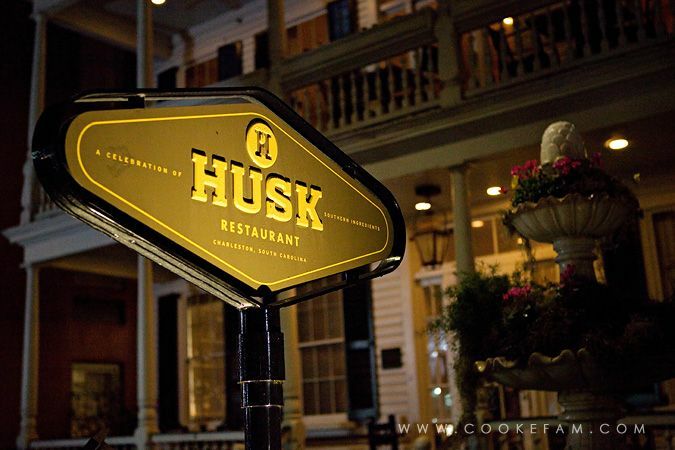 That night we had made reservations at Husk Restaurant. Let me stop right here and say that we were in Charleston during their yearly food and wine festival. Great, right? Except it made getting into restaurants a little tricky. We were actually very lucky and got into all the places we wanted by making reservations early enough. For all of you who make fun of me for planning (too far) ahead...there's the payoff! 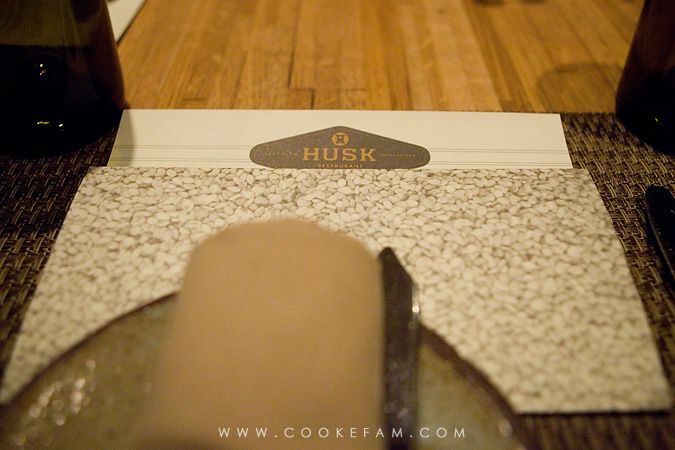 The restaurant had a very modern, earthy, and welcoming feel. 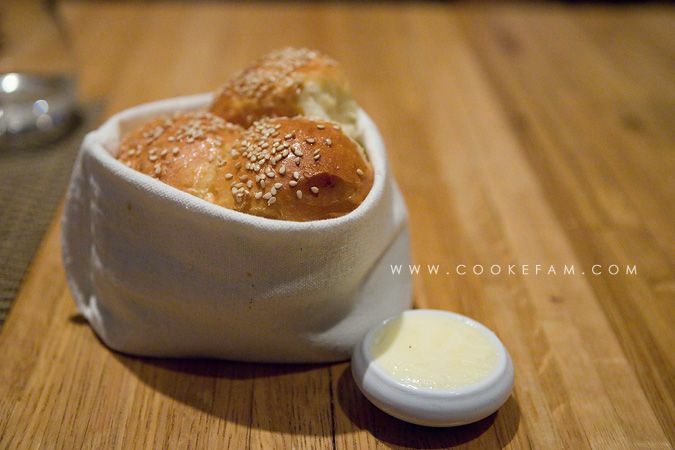 First, they bring you warm rolls topped with sesame seeds and soft butter. By the way, I can almost judge a restaurant based on their butter. If they serve it softened, then they probably know their stuff. Cold butter that doesn't spread on bread just kind of reveals an ignorance of food, in my opinion. I am sure there are exceptions. Let's just suffice it to say that I appreciate soft butter. 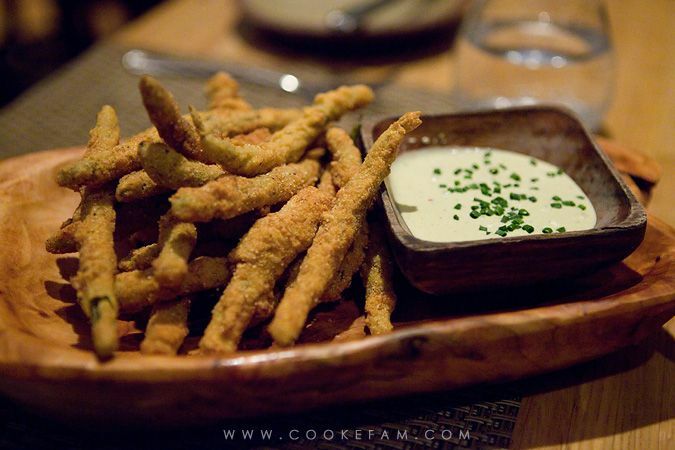 Mom ordered the cornmeal fried dilly bean pickles with cucumber buttermilk ranch. She said they were excellent...she raved about them, in fact. I detest pickles so I wouldn't know. But they actually look great. 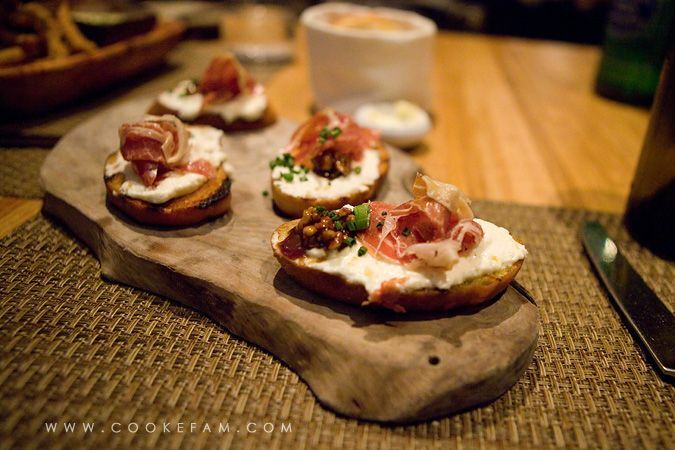 This was my appetizer...Grilled Ciabatta with Whipped House Ricotta, Preserved Lemon, Pecan Marmalade and Edwards 5yr Country Ham. Yes, it was just as amazing as it sounds. I have no more words for it. But take a peek at our serving dishes...loved the wood. Again, very earthy and modern. I was at a loss at to what to order because all the entrees looked insanely good. 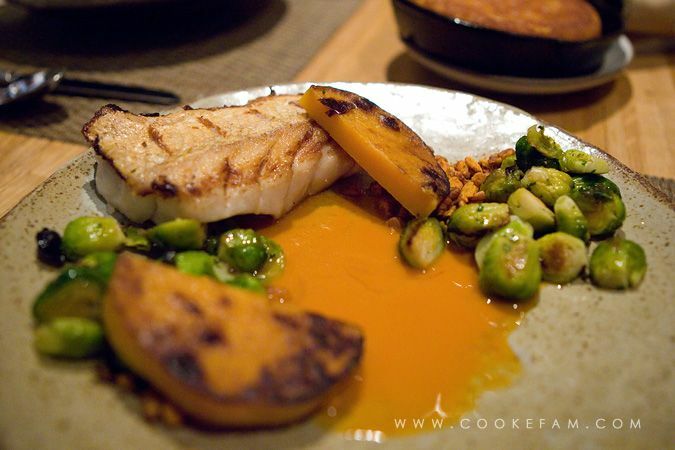 I decided on the Golden Tilefish from Mark Marhefka, Roasted Brussels with Cara Cara Orange, Spiced Pecans and Butternut Squash Juice. Well, good decision on my part. The brussels sprouts probably tipped the scales in favor of this dish because they are my favorite veggie. Not pictured - my mom ordered the VA Heritage Pork with Field Peas and Roasted Peppers, Wilted Arugula, Pot Likke. I had a bite and it was perfect. 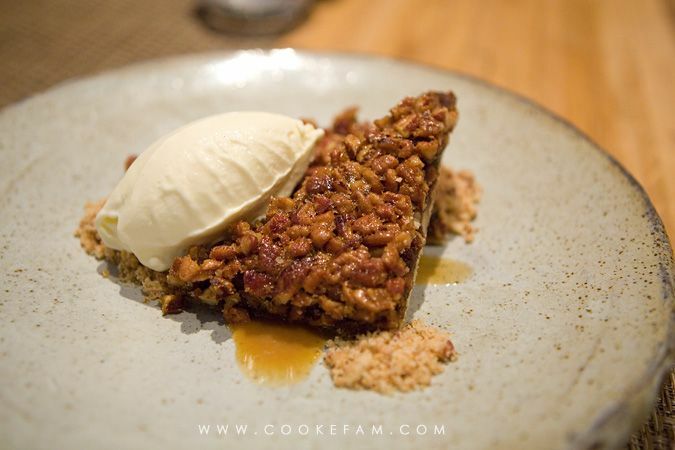 For dessert, we decided on the pecan tart with homemade vanilla ice cream and some kind of crumble. I can't find the exact description of this dessert, but it was pretty good. It was a nice, modern twist on pecan pie. After dinner, we hustled back to the hotel, threw on the fire and our robes and settled into bed for the night. It was the perfect way to end a day of flights, cold, misty weather, and getting our first taste of Charleston. 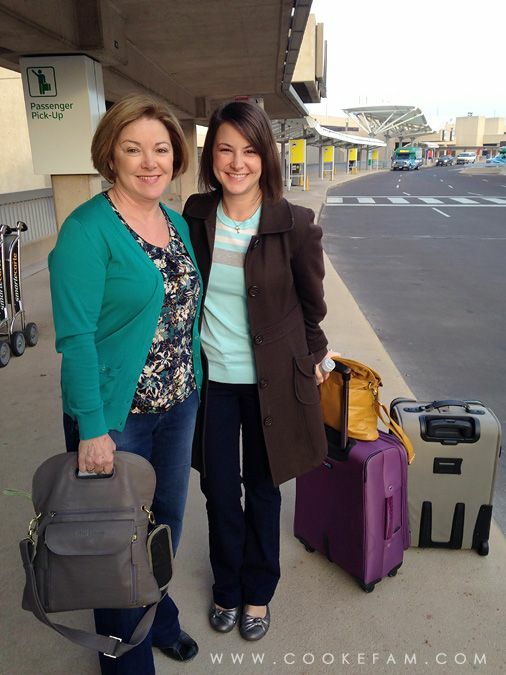 Just trying to get caught up on your blog - I love the purses you and your mom have - what brand are they? Erika, they are Kelly Moore camera bags (the Posey 2). They are specifically designed for DSLRs, but my mom uses hers with her point and shoot. We love them!